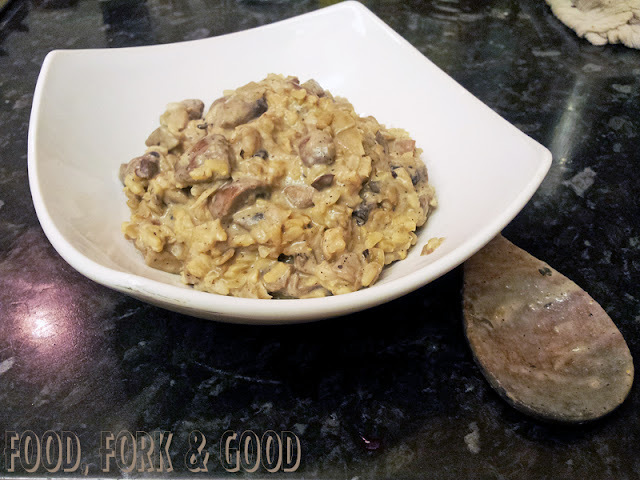 Creamy Mushroom & Bacon Risotto - Fork and Good. Now, I've had this before, where I've been told I can't call my recipe something because it's missing an ingredient. A bit like the whole champagne only comes from champagne argument. My argument is, if it looks, tastes and smells like what I'm calling it, I'm calling it that. Which is why my fizzy wine will forever be champagne to me. Trust me here, it helps with the flavour. Now I'm not about to go on about the benefits of eating brown rice as I actually like all types of rice....especially rice pudding. But brown rice soaks up nicely in the dish and has a lovely nutty flavour. Plus, you need a rice for this dish that expands. Enough rabbiting, here's the recipe as I made it last night. Make changes, take things out if you don't like them etc. This serves four people. Cook the brown rice according to instructions. Add the soy sauce into the cooking water. If you're cooking lentils from dried, prepare these now too, if you're using canned, drain them. In a large pan, cook the bacon with the garlic, olive oil, oregano, pepper, stock cube & Worcester sauce. Add about 200ml of boiling water to the pan and mix well. After a couple of minutes, add all the vegetables & mix well. Reduce the heat & leave to simmer. 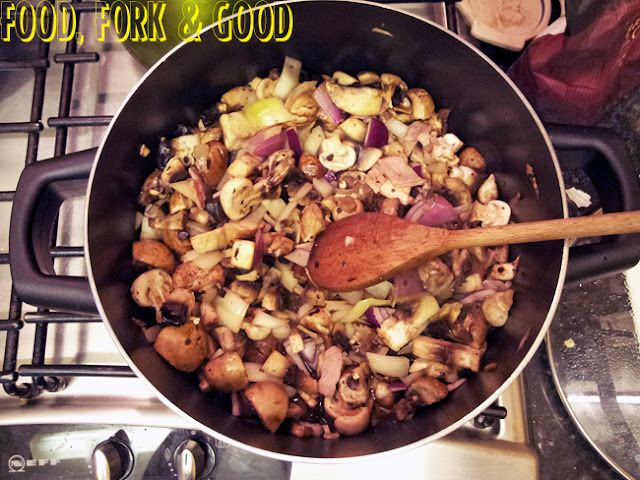 The mushrooms should reduce, add the lentils and mix well into the vegetables. Pop the lid back on and leave to simmer for a few minutes. Next add the brown rice. Make sure you mix well. Now, add the soft cheese and mix it all in until everything is covered and creamy. Add more pepper if you like it warmer. Looks delish! How many PPs does it have?